Terra Infinity’s excellent digital implementation of designer Jacques Zeimet’s popular little dexterity/reaction game Ghost Blitz has just gone on sale for 99¢ (reg $2.99) for the weekend. This is the first time the game has been put on sale since its release last September. 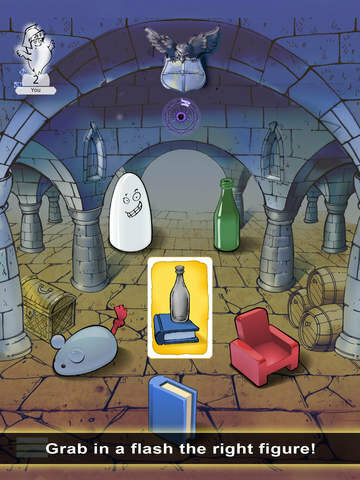 It is a simple, yet challenging game where 5 objects (a green bottle, white ghost, blue book, red chair and gray mouse) are placed around a center card. The card in the center has a cartoon picture depicting two of the objects which is a ‘code’ for one of the five items. One or both of these object will be incorrectly colored and players race to be the first one to correctly identify (and grab) the correct target object from the ring of objects. If one of the objects is colored correctly then that is the target object, if both are colored incorrectly, then the target object is the one that is not represented in the picture by either its color or shape. It is a race to collect the most number of cards. In correct guesses cause you to lose a card. The game play is fast and fun and perfect for any age player. There are multiple game modes available including a worldwide speed tournament where games are happening every three minutes, as well as local and online play with AI and human players and even a solo survival mode. This is a nice deal for just 99¢, especially given that the physical version sells for $17+ on Amazon. Today, Terra Infinity is running a giveaway on their Facebook page where they will be giving away 20 or more free codes for the app as well. If you want a little peek at the game, you can watch the short 2 minute review below by The Dice Tower’ Board Game Breakfast App Queen, Suzanne Sheldon.